Sterling at Burke Mountain is a village-style neighborhood of single-family homes inspired by the communities of Kerrisdale and Shaughnessy. Located south of David Avenue in Coquitlam, it is a development of 40 beautifully constructed single-family homes that combine traditional craftsmanship with modern styling. 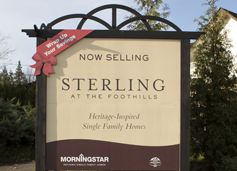 The Sterling homes range from 2400 to 3200 sq. feet including an unfinished basement. Each of the three available floorplans includes 4 bedrooms, gourmet kitchens with granite counters, spa-like master ensuites, hardwood flooring and a detached garage. These homes are perfect for young families looking to upgrade to more space without compromising on quality. The village-style community is set amongst the natural beauty of Burke Mountain's many parks, trails, shopping and schools. Contact Rebecca Permack for a comprehensive community update. If you are interested in re-sale opportunities, we would be happy to notify you immediately if something comes available. From 3,000 - 4,000 sq.ft. approx.